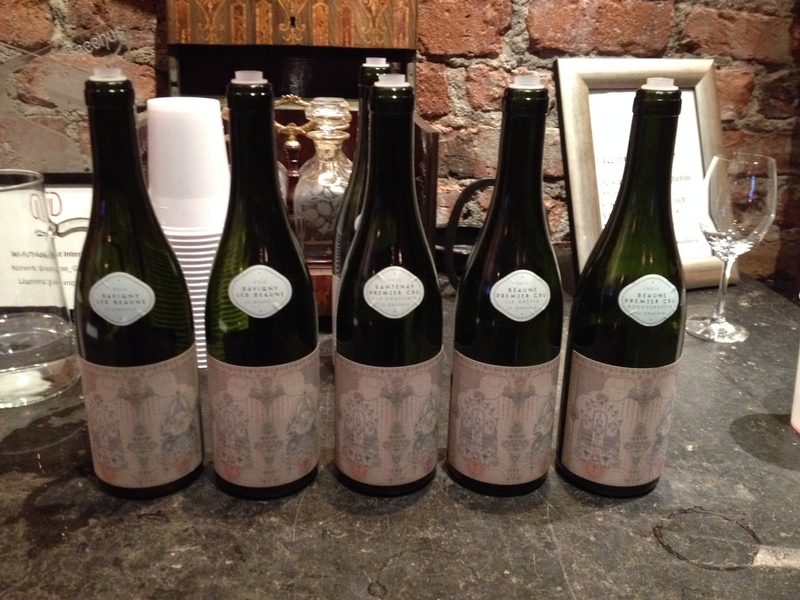 French-Swedish niche importer Caviste put on a tasting of some red and white Burgundies from Le Grappin, a recently established winery run by an Australian, Andrew Nielsen. I also tasted wines from this producer chez Caviste in August last year. A somewhat different selection of wines was presented compared to last year, since th 2013 vintage gave so small yields. This has unfortunately been something of a recurring story in Burgundy in recent years, with increased competition for the few bottles (further exacerbated by increased interest from the Asian market) and increasing prices. This means that Martin from Caviste spread his buying over more wines. Chardonnay, three barrels produced in 2013. Nose with a rather fruity impression with pear, some citrus, some mineral, some white flowers, a hint of oak and butter. The palate is medium bodied with pear and apple with some apple must character, slightly spicy, good acidity, and a fruity aftertaste. Rather approachable now, 87-88 p.
Chardonnay, two barrels produced in 2013. Nose with apple, hints of citrus, mineral including hints of clay and earth, hints of oak and perfume. The palate is medium bodied (+) with green apple, citrus, mineral, high acidity, and a green-apply aftertaste with minerality. Young, would do well with cellaring, 88-89(+) p.
This wine is clearly most in need of cellaring of the three whites, and then I actually tasted it from a bottle that had been opened a couple of hours. Nose with yellow apple, some yellow plums with hints of peach, some oak and butter. The most classical oaked white Burgundy nose of the three. The palate is medium bodied (+) with apple, citrus, mineral, high acidity, and a mineral-packed aftertaste. Younger and firmer on the palate than what the nose indicates, could develop, 89(+) p.
Although this wine could gain from cellaring it is not in as great need of cellaring as the white Santenay Premier Cru above. Pinot Noir from the Aux Fourneaux vineyard. Nose with cherries, some chalk notes and hints of orange zest. Possible there’s also a slightly green note hovering in the background, but it isn’t too pronounced. The palate is medium bodied with cherries and raspberries, noticeable minerality, high acidity, and an aftertaste with apples, cherries, and some tannin. A firm and young wine that could do well with some cellaring, 87(+) p.
Many red 2013 Burgundies that I have tasted are rather firm with marked acidity, so this wine shows a style that is rather typical for the vintage. The 2012 of this wine had developed quite much in a year (see below), so I venture a guess that this wine will be more accessible already next year. Pinot Noir, seven barrels produced in 2013. Elegant nose with strawberries and cherries, perfumed and flowery notes, and a hint of orange zest. Rather light-coloured fruit component and a complex nose. Palate with strawberries, some cranberries, minerality and a chalky impression, high acidity, hints of tannins, and an aftertaste with apple and raspberries. Rather young, elegant nose, 89-90(+) p.
At current, this wine is more approachable than the red Savigny-lès-Beaune, but I guess its development curve will be longer. Complex nose with ripe strawberries, some cherries, some orange zest, some flowery notes, and a hint of animal notes. Comes across as rather open. The palate is medium bodied (+) with strawberries, minerality, chalky impression, high acidity, and a mineral-dominated and firm aftertaste with some tannins. A young palate together with a complex and wonderful nose, 88(+)/89 p.
Quite a lot had happened to this wine in a year, and it has now a more complex and “bigger-sized” nose. Last year I scored it 87+ p and wrote “already a year in the cellar could probably do some difference here”, which pleasantly enough turned out to be correct. Based on these wines my opinion is that the style of Le Grappin is pure and elegant with noticeable acidity, although this is also a vintage character of 2013 Burgundies. The red wines show rather moderate tannins that primarily make themselves felt in the aftertaste. To anyone who thinks this profile sounds like your type of Burgundy, the wines are clearly worth seeking out.